Most televisions won’t have the computing smarts needed to access content online or play it back from a hard drive. Televisions are a ubiquitous form of technology and forking out to buy a smart TV doesn’t make sound sense. This is a dilemma Western Digital is trying to solve with its WD TV, a media player savvy enough to jump online with a friendly retail price of $150. It consists of a box the size of a hard drive and one of the most ingeniously laid out remote controls. Lining the back of WD TV are a series of connectivity ports. It ships with RCA cables and, although it supports HDMI, the high-resolution cable isn’t bundled. RCA supports video up to 576i, while HDMI represents a significant upgrade with a maximum resolution of 1080p. Additional connections include an optical out, an Ethernet port and two USB connections — one of which has been positioned at the front. Navigating the refined interface can be done by way of the included remote control or by downloading the free application for users of Android or Apple. The remote is ergonomically designed and intuitively laid out. Our only gripe comes from the stout feedback given by the buttons, which we hope soften in time. The application works over three panes, tying in from left to right available online services, virtual buttons and settings. Thought has evidently been put into its layout, though the application fails to take advantage of a smartphone’s pivotal asset: it’s keyboard. Entering text into a search field has to be done with the use of navigational buttons; a primitive and impractical text-entering method. 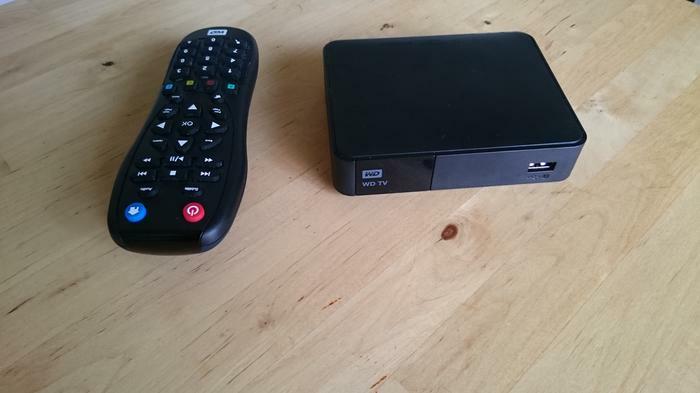 Using the services of the WD TV would’ve been a lot more enjoyable had it allowed you to enter text on your smartphone, hit enter, and then have the WD TV take over. Western Digital has inched in this direction already by including the smartphone mirroring standard Miracast. The idea is the content on your smartphone can be wirelessly played back on your television through the WD TV set-top box. Miracast remains one of the simplest forms of screen mirroring available. We were disappointed to find WD hadn’t utilised the technology to its full potential. Smartphones have enough power to ‘throw’ content in the background so that they can be used as normal while a movie, for instance, is being played back on a television. WD’s rendition of the standard appears immature as exiting a movie player or gallery on your phone instantly halts playback on the television. Zooming in and out on a photo should be mirrored on the television when using the standard. The WD TV could only show the full sized photo. The alternative is to mirror the entire smartphone’s functionality directly from its menu, although note a solid home network is needed for this to work well. 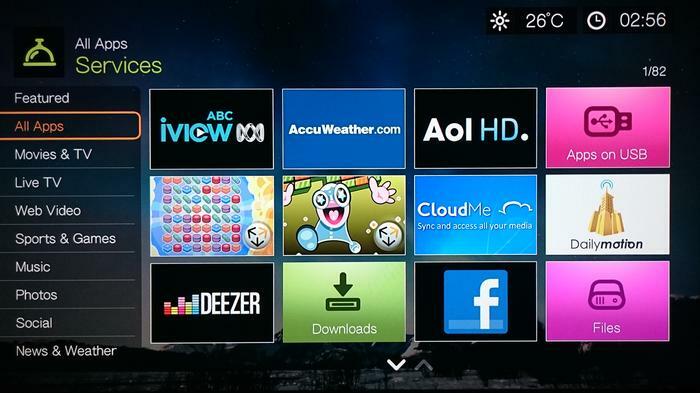 The WD TV offers a range of video-on-demand services and apps from its own application store. Some of the available applications and streaming services include ABC’s iView, Facebook, AOL TV, Accuweather, Deezer and, provided you have a subscription, Spotify Premium. These services have been tailored to look fantastic on a television. It’s just a shame you have to resort to entering text by way of inefficient navigational keys. Most won’t bother with the online component because the WD TV’s best feature is its fantastic support of media. Thumb sticks and hard drives can be plugged into a USB port and have their content played back, easily, on a television. There’s an elegance to the simple interface, its media players and the way it uses the real estate of a TV to best display the content on a hard drive. 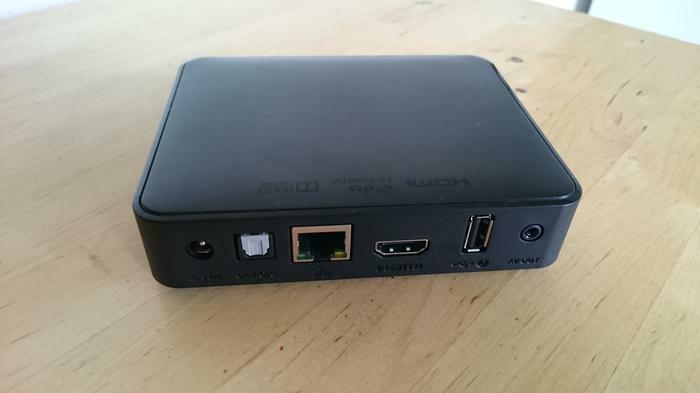 Throughout our month period of testing the WD TV, we couldn’t stumble across a single file format that would not work. The nifty little unit even supports five subtitle formats. Be weary it does not work with every hard drive format. We had no problems with a FAT32 2TB drive, but the WD TV would not read a 2TB drive in the less popular exFAT format. The WD TV is a fantastic multimedia player, versed in a number of file formats and dressed in a refined interface. We applaud its range of connectivity options, and although its current use of the Miracast standard is limited, are hopeful WD will build on it with future updates.